Old-time fiddler Emmett W. Lundy grew up around music in Grayson County, VA, on land that his family had owned since the 1700s. He began playing the fiddle in his late teens, taking up with an older fellow named Green Leonard, who happened to be an expert on the instrument. Through reconstructed histories of this era, it is evident that Leonard was one of the most highly reputed fiddlers in the area, and would have been somewhere between 65 and 80 years old when Lundy was hanging out with him. Many of the pieces of music Lundy played and eventually recorded were learned first-hand from Leonard, in a process that required a lot of hanging around and listening. Thus, when Alan and Elizabeth Lomax recorded Lundy in 1941 on behalf of the Library of Congress, what was being documented was actually fiddle music dating back to the turn of the 19th century, at least. Playing the fiddle itself might have been a bit like pulling teeth for Lundy in the beginning, since playing a musical instrument went against the religious upbringing he had received as a member of the Primitive Baptist Church. The so-called “devil’s box” may not have scorched Lundy’s fingers, but the religious pressure might have been one reason he didn’t pursue a career playing at dances. He did make it to early fiddle contests, though, and is reputed to have won the first prize ever presented at a Galax fiddle contest, namely a ten-dollar gold piece. Lundy never performed with a band, but did collaborate on music at home with several other fiddlers who lived nearby, Isom and Fielden Rector. He also played with Crockett Ward, who was a member of a band called the Bogtrotters. Another member of this group, guitarist Eck Dunford, also used to get involved with these sessions, rumored to have sometimes lasted up to 48 hours. 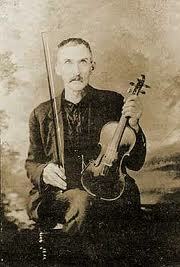 Dunford was the first guitarist to have the chops to back Lundy up on fiddle tunes. Lundy’s only venture into professional music was a collaboration with the best-known of the Grayson County old-time players, the much younger guitarist and harmonica player Ernest V. Stoneman. This duo recorded several songs for Okeh, Lundy’s only contribution to the so-called hillbilly music genre, but apparently mixed so badly that the fiddler lost interest in recording his music completely. Maybe he just didn’t have the time. He raised 14 children, the family raising everything it ate as well as tending orchards. Music was of course part of the scene and passed along to the children. When the Lomaxes recorded Lundy, sons Kelly J. Lundy and Geedy Lundy provided accompaniment on guitar and banjo respectively. These recordings were reissued by the String label as Fiddle Tunes From Grayson County, Virginia, featuring almost two dozen samples from the historic Lundy repertoire. The fiddler continued passing this material along to many other younger players who studied with him, including Charlie Higgins.